"My impressions of Rob Fowler as a birder and nice all around companion? I have been in the field with Rob on many occasions, too numerous to count. He is intense, finds birds with ease, knows them to a "T" and is eager to share his knowledge and sightings with everyone. Since my own skills have declined somewhat due to advanced years, I find that my association with Rob is of increasing importance to finding out about rare birds and then actually finding them in the field. He is OUTSTANDING with sharing information to all who might be interested in a new sighting. He is among the top 5 people (among thousands) I have ever been in the field with when it comes to finding, sharing knowledge, and identifying birds. " One of the many Lazuli Buntings we encountered on 6 June 2014 while birding the high country around the Horse Mountain area. I was referred to Rob when I was planning a trip to Humboldt County in California in 2014. I was looking for a birding guide that could help me to locate California species and western U.S. bird species that I could add to my life list. I was not disappointed! Rob was able to locate dozens of species for my partner and me. We got amazing looks at many species that were new to us, as well as glimpses of some active nest sites. Afterward, Rob provided us with lists of our bird sightings and even some photos of the more cooperative birds we had seen with him during our all-day adventure. Rob is extremely knowledgeable about all aspects of birding. He knows where to find whatever bird you may be looking for, and has all the skills that should accompany an excellent birding guide. He is also very ethical and avoids undue disturbance to breeding birds. But beyond that, he is just a pleasure to be with in the field. He goes out of his way to ensure that you have a positive birding experience. Rob is much more than a birding professional--he is a good birding pal! "We engaged Rob Fowler to guide us in Humboldt County for two days in mid-May 2014. We gave him primary target Sooty Grouse and a number of secondary targets we had seen before, but seldom. We were delighted. He is knowledgeable, thorough, intense, fun to bird with, and full of energy. He shares his knowledge easily and frequently. He scouted for Sooty Grouse the day before we went out with him and had it staked out—we had long, satisfying looks at a pair. His subsequent report was a beautiful thing, with very complete bird lists and accurate maps—and striking photos. He knows the area so well he can plan efficiently and still be flexible. Rob Fowler is the guide you want in Humboldt County." Sooty Grouse, 12 May 2014 staked-out the day before for John and Laurie. male Purple Martin. 10 May 2014. Seen while birding with Terry and his wife Kimberly and friends Carla and Dwayne. "I have been out with many excellent birders over the years including Benjamin "Mike" Parmeter, and a couple Ornithologist professors. I have never been more impressed with a birders ability to instantaneously hear a bird and find it in his spotting scope rapidly and focus for his clients to view it before it flies away! Rob Fowler has this uncanny ability to find bird species that are difficult to detect even by seasoned birders. He has excellent "ears" and knows immediately the species calling and then find it in his scope. His warm pleasant personality coupled with his extensive knowledge of birds makes for a very productive and fun day birding. In my opinion Rob Fowler is unsurpassed as a field guide in Humboldt County." "I had a wonderful day of birding with Rob Fowler thanks to a thoughtful gift certificate from my husband. I am a new birder and was both thrilled and afraid to go birding with such a professional. But it was a fun and informative day since Rob knows how to present information without overwhelming a newbie. Rob showed me almost every bird in the scope which was such a treat. What a great way to learn and enjoy the birds and the outdoors in Humboldt County. I highly recommend a day birding with Rob Fowler." Male Allen's Hummingbird. 27 April 2014. Seen while birding with Mary at the Mad River Fish Hatchery. 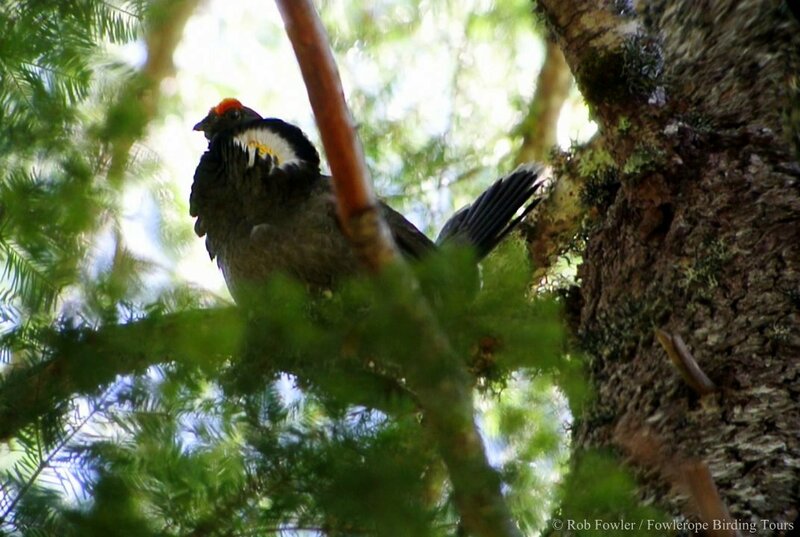 "When I first commenced my research for a winter CA trip, many months before my planned departure, Rob's depth of knowledge of the birds, habitats and birding sites in Humboldt County was totally invaluable. I would go as far as to say that without his help and encouragement I would never have ventured this far north, which would have been a great omission to any winter CA trip, as this county is outstanding! Rob went on to accompany Victoria and myself on a highly enjoyable February day in the field, securing such mouth-watering birds as American Barn Owl, Aleutian Cackling Goose, Ferruginous and Rough-legged Hawks and Ruffed Grouse. Rob is both a hugely accomplished birder and fine company in the field." 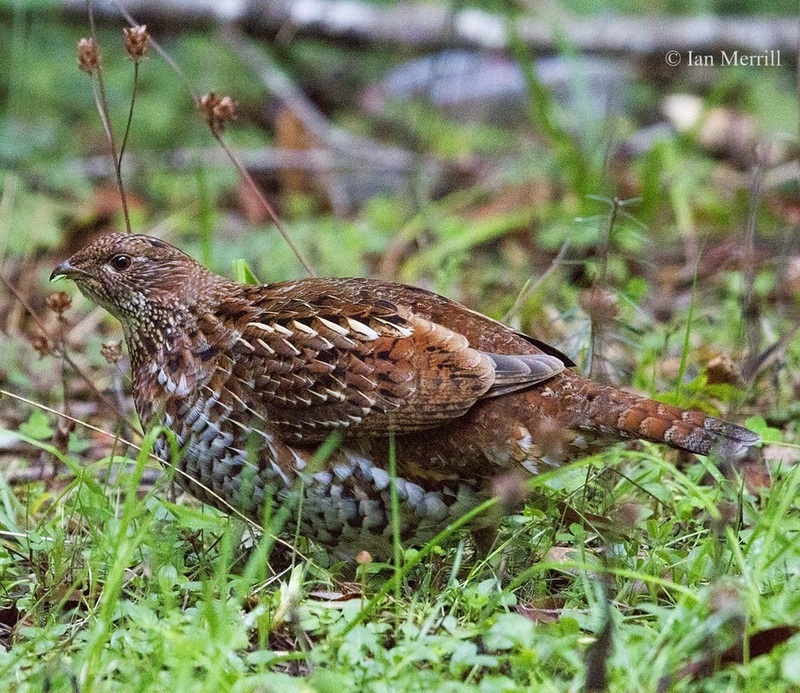 Click on the Ruffed Grouse (Ian's photo of his lifer!) to see the trip report from this day. "I had never been birding west of the Mississippi and I made a list of birds which I expected to find and check off my life list. I knew I would need the help of someone familiar with the area and the birds I had highlighted. I found Rob's name on the local Audubon chapter's webpage and contacted him. I provided him my list and let him know I had limited time to spend in Arcata. I needed to do some power-birding. Rob came through with style, knowledge and personality! Every bird I expected to be a difficult endeavor Rob found with ease. His knowledge of ornithology and the environment was exceptional. I "ticked" off birds rapidly. Rob was very helpful in providing information of other birds which were on my list but not in the local area. Without Rob's guidance I would never have checked off 57 new lifers on my trip out west. Very enjoyable-thanks Rob!" 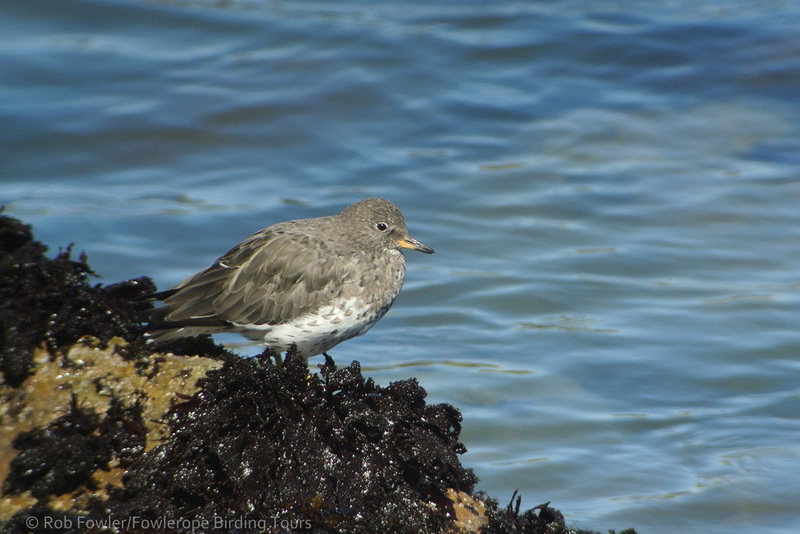 Click on the Surfbird (John's lifer) to the left to read the trip report from the day. "We are from Chicago and were in Northern California for a wedding September, 2013. We came in few days early to bird. One of the wedding party suggested Rob Fowler and promised that birding with him would be memorable. They were absolutely correct. After speaking to us, Rob carefully tailored the day . From rocks on a shore, to a marshy area and wrapping up in a woods, we saw so many birds that I could not write them down fast enough. Yet, Rob never hurried us. We are not experts, and Rob was infinitely patient with answering questions. Additionally, he was very knowledgable about the geology, plants and other critters. He has a great sense of humor- I especially remember him pointing out the Wandering Tattler- and is a really nice person. What a great day. What a great guide." 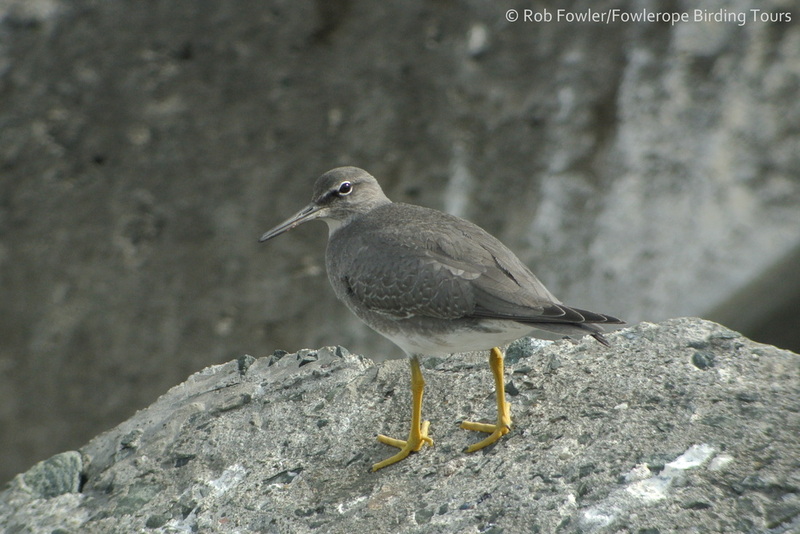 Click on the Wandering Tattler (Judy's lifer) to see the trip report from the day. "I met Rob online when he commented on one of my photos on Facebook. We exchanged a few messages and emails. It was obvious that he knew what he was doing and would be a likable character. I made the decision to alter my itinerary in California to include a day of birding with Rob. This turned out to be a very good decision on my part. We met at the airport in Arcata so that he could sign on to a contract giving him permission to legally drive my rental car; this proved to by a valuable arrangement. I was very pleased with my first impression of Rob, he is very personable. I wanted to include a message on Rob's testimonial page and started composing. I looked over the entries on that page and felt that all I can do is reiterate the positive accolades Rob has gotten. I can add ‘very personable’, ‘likable character’, ‘knows the birds by sight and sounds’ and strongly agree with the list above. 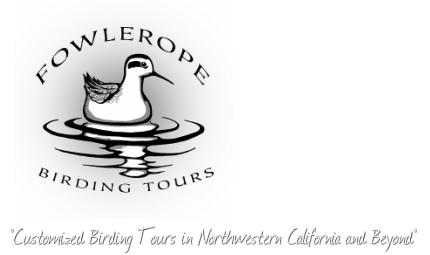 I urge any easterner, actually anyone, who are travelling west to seriously consider connecting with Rob to arrange a birding adventure in Northwestern California." 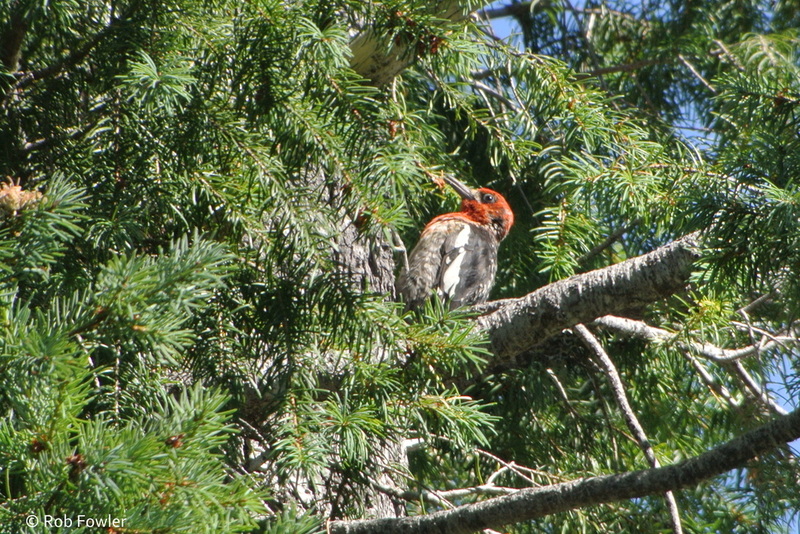 Click on the Red-breasted Sapsucker (Doug's lifer) to the right to see the trip report from the day. "Just amazing pictures and what a great guide in Humboldt County! A day with Rob is super, he is a great spotter and ear-birder, plus told us about a super place to wind down for dinner after our 12 hrs of birding!" 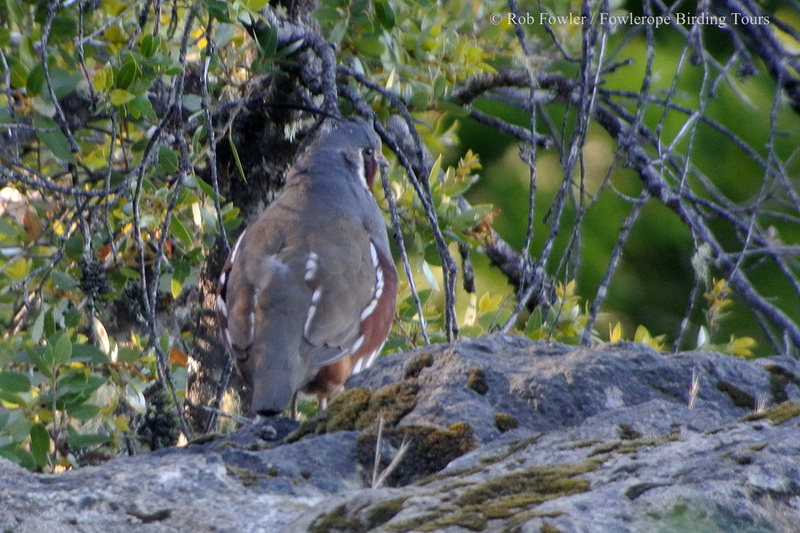 (Click on the Mountain Quail to read the trip report from our day). Thanks again for the terrific day of birding. Your ability to locate and identify the species we encountered was awesome, but equally important was the excellent preparation for the trip and the follow up. Our initial discussions concerning the target birds, your careful planning of the itinerary, and then your providing the e-bird list of the 103 species identified and pictures following the trip made it an overall fantastic experience. Our final count of "lifers" was 12, the largest one day count we have had in a number of years. Thanks also for your recommendations concerning other birding locations - where we picked up 4 additional target "lifers" and for your sharing information concerning the flora and the community in general. Traveling with you was really enjoyable - a great combination of a mellow, friendly experience with intense birding." Read my trip report for Bruce and Jean's tour with me here with many photos from the trip including their lifer Hermit Warbler seen above left. I just got around to adding all my new California birds to my life list. I bumped it up from 510 to 556 thanks to you. Roosevelt elk, Black-tailed deer, California Ground squirrel, Brush rabbit, Harbor porpoise, Gray whale, and the Elephant and Harbor seals. And your knowledge of the local flora is also exceptional. FIVE stars! Thanks again." Blue Lake Cottonwoods on 3 May which was chock full of migrants! On 4 May we met before dawn to drive north to Prairie Creek Redwoods State Park for murrelets and redwoods. We then enjoyed Amerian Dippers at Lost Man Creek. Spent some time at Davison Rd., north of Orick, where we enjoyed a large flock of migrant Vaux's Swifts and many other migrants. We then went to enjoy the lush and beautiful Fern Canyon. After Fern Canyon we went to Trinidad for lunch at the Beachcomber Cafe. After lunch we birded around the Trinidad Museum where we found some migrant Western Kingbirds that were reported to the Northwestern California Birdbox (707.822.LOON) earlier in the day. After Trinidad we drove north to Patrick's Point State Park to look for Gray Jays and look for seabirds off of Wedding Rock. After Patrick's Point we spent some time looking in Trinidad Harbor and saw a yearling Elephant Seal. We finished the day with a short drive down Crannell Rd., north of McKinleyville and had more nice looks at some migrant Western Kingbirds. We ended the 1 1/2 days with 102 species. ".....And sandwiched in between all of that is, of course, the piece de resistance — our birding adventure at the Arcata Marsh! I booked a tour with the fabulous Rob Fowler, who guided us through the wonders that constitute the marsh, patiently answered our questions, and regaled us with incredible close-ups (a scope! a scope!) of a Lesser Goldfinch (Spinus psaltria) — a life bird for me!! — and an Anna’s Hummingbird (Calypte Anna), which patiently posed (and sang a rather loud cacophonous tune) for us while we marveled. There were other sightings, including a bunch of ducks in fall plumage (not my favorite — they all look female and I can’t tell any of them apart! ), and other fine specimens. I hope to revisit the Arcata marsh one day…"